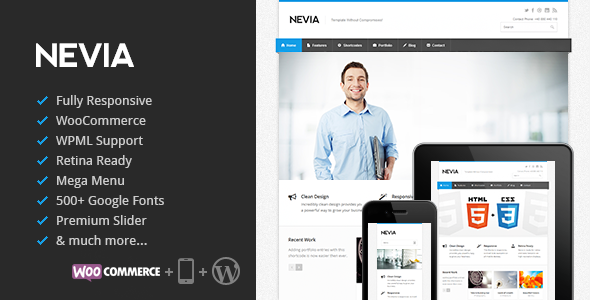 Nevia is a premium Responsive Multi-Purpose WordPress theme created for corporate and portfolio websites with support for WooCommerce. It features a very clean, responsive design that is perfect for creating professional image of your company. It's easy to customize with awesome features like LayerSlider, OptionsTree panel for settings and WordPress Customizer. It's also Retina ready, has plenty of easy to use shortcodes and tools (like MegaMenu! ), and is compatible with WPML – The WordPress Multilingual Plugin!